The issue of unrelated consenting adult polyamy (UCAP) is proceeding through the courts. On Thursday, January 21, 2016, the “Sister Wives” case, formally known as Brown v. Buhman, was being heard at the Tenth District Circuit Court of Appeals in Denver, Colorado. This court is the very last court before proceeding up to the Supreme Court of the United States (SCOTUS). To explain the issues of UCAP polygamy and that particular case, I began giving many media interviews. 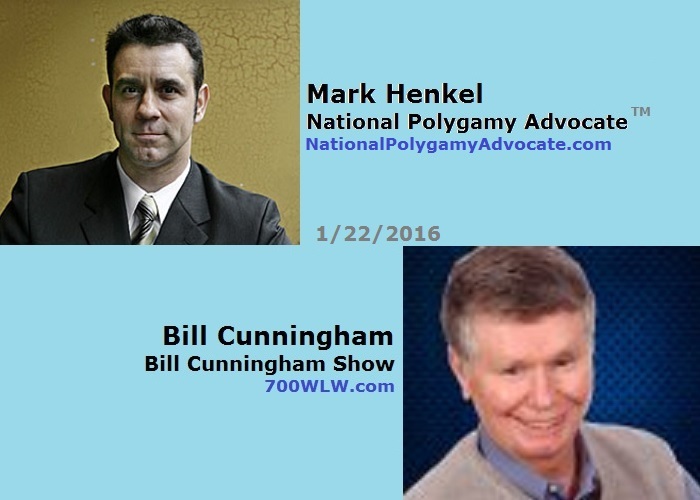 For the next afternoon (Friday, January 22, 2016), I was scheduled for 2:05pm ET to give an interview on The Bill Cunningham Show, on 700 WLW, in Cincinnati, Ohio. After it was posted, the posted youtube was also announced on twitter. Serendiptously, this interview has become an excellent tool for supporters of UCAP (unrelated consenting adult polygamy) to use for explaining the issues.